New York - In the past, Jerwin Ancajas has boxed and fought under the shadow of his countryman - the great Manny Pacquiao. But in recent years, the twenty six year old son of Panabo, Davao del Norte in the Philippines is slowly and successfully creating a name of his own in the sport that has brought attention to a country of a hundred million people. Ancajas is one of only two reigning world champions from the Philippines and that title - the International Boxing Federation Junior Bantamweight belt - will be at stake tonight at the Bank of America Center in Corpus Christi, Texas against a challenger ranked in the top 10 of the division - Israel Gonzalez of Mexico. Their fight carries a heavy significance for the young Pinoy champion. Ancajas will make his first step away from Pacquiao’s shadow in his fourth defense of his title against Gonzales. This will be his first venture in the United States under Top Rank, the very same company that signed Pacquiao more than a decade ago. Undefeated as a champ, Ancajas will be able to showcase his talent in front of boxing fans that has showered Pacquiao support in the many years that he has fought in the States. ESPN will show their fight live from Corpus Christi starting at 10:15 pm ET. “Excited na excited po, lalo na si Jerwin.” (We are very excited, especially Jerwin.) was Joven Jimenez’s reaction when Philboxing reaches out to him about tonight’s event. Jimenez is the boxer’s trainer and longtime father figure since his training and fighting days in the Philippines. “Sobrang saya po ni Jerwin, bigay daw po ng Panginoon.” (Jerwin is elated, he said that this is a gift from God.) added Jimenez. 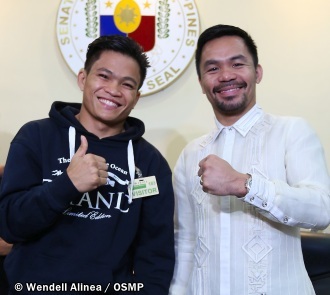 Filipinos relate opportunities as spiritual blessings, Ancajas and his team is no different but the boxer’s road to Top Rank and ESPN started when he made his professional debut at a young age of seventeen in far flung Polanco in Zamboanga del Norte. He won by knockout against Rey Buluan, a countryman in 2009. His recent success is also product of his eye catching performance in the ring. Since winning the belt from McJoe Arroyo in 2016, he has defended it by stopping his last three challengers - all outside of the Philippines. This is what he wants to replicate tonight against Gonzalez in his US debut. “Gusto po niya ipakita sa lahat na maganda ang performance niya.” (He wants to show everyone his best performance.) said Jimenez. (It is a lot of pressure but I told Jerwin to not pay it any attention but instead use it as a motivation to improve his performance.) Jimenez remarked. Pacquiao is now semi-retired and Pinoy boxing fans in the US have long waited to cheer for the next boxing hero from the Philippines. Ancajas and his team is ready to fill that spot.